So, it's been raining lately... a lot.... pretty much like a monsoon. There were flood warnings, then watches, then houses being taken out by mudslides. Pretty damaging stuff. But, yesterday was the first day in almost two weeks that the sun came out for a portion of the day. So, I took advantage. Since we've been working on renovations inside our house for the past year, my husband and I definately agreed that this year, we would focus on the outside. So, the sun is shining, and the wind is blowing, but it's gorgeous in comparison to rain. I headed outside for a day doing yardwork ... and man, is there a lot of it to do. I happened to buy some grass seed, but I can't put it down until we get rid of some more weeds. Weeds. Ugh. There's so many.... and they're very hardy. But, nevertheless, I will try my best to get a lush, beautiful yard (one day). SO, the grass seed had to wait.... along with the weed killer, since the news is predicting more rain. I decided to work on transplanting some flowers to make room for my "crops." This year, I am planting a vegetable (and some fruit) garden. Corn, onions, sugar snap peas, potatoes, raspberries, and tomatoes are on the list of things to grow. 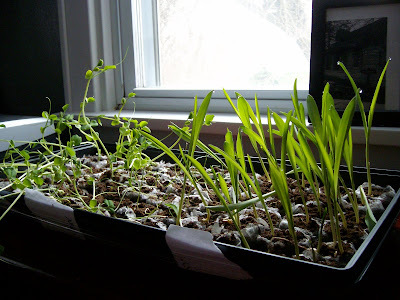 I already began my corn, onions, and sugar snap peas indoors... and they are really taking off. I really need to plant them soon and was going to do that yesterday, BUT not only is rain in the forecast, but freezing temps and a chance of snow is headed our way. I've had it with this crazy weather. So, after days of rain, the sun has finally decided to shine today! It officially feels like spring! I've got flowers coming up and a lilac bush that is ready to burst. Pictures will be posted when they all decide to pop out. But for now, I'm just enjoying the sun!